I'm pretty sure you all already know that Glitter Gal has recently released a 9 piece addition to their holographic line. Today I have 2 of them to share with you : Green Suede Shoes and Belgian Chocolate. 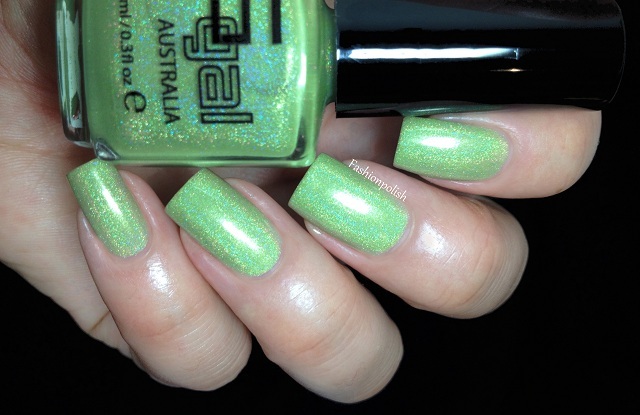 Green Suede Shoes is a yellow based mint green linear holo. 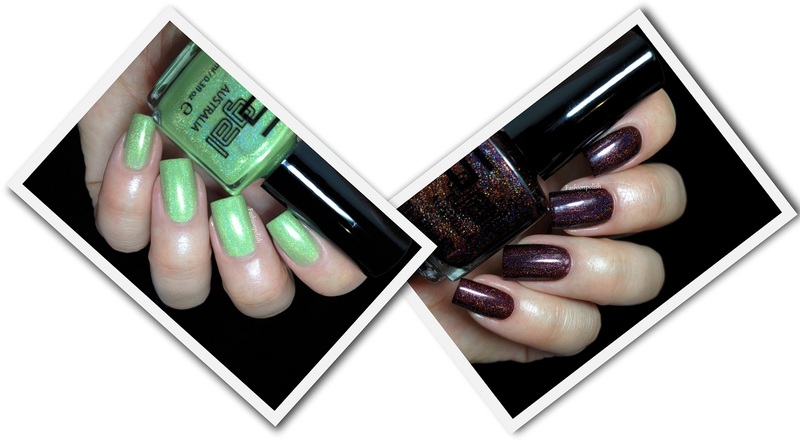 Formula was a little sheer but it applied really nicely and the holo effect was quite noticable even on the first coat. I had to use three to reach full opacity but I think I will layer it next time. No topcoat in these swatches. 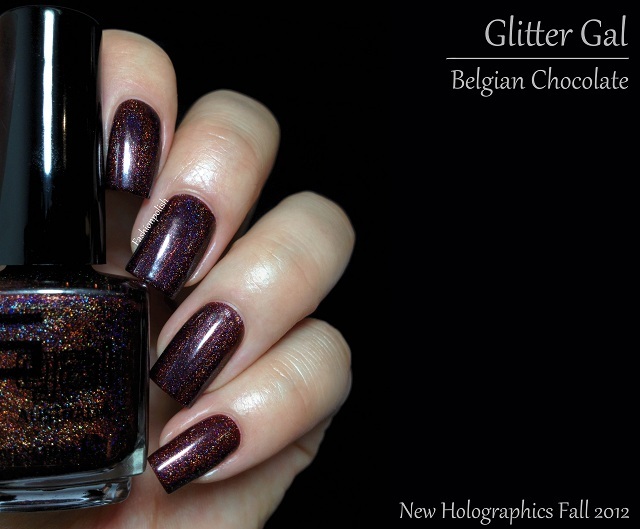 Belgian Chocolate is a vampy maroon brown with a "bordeaux" base. 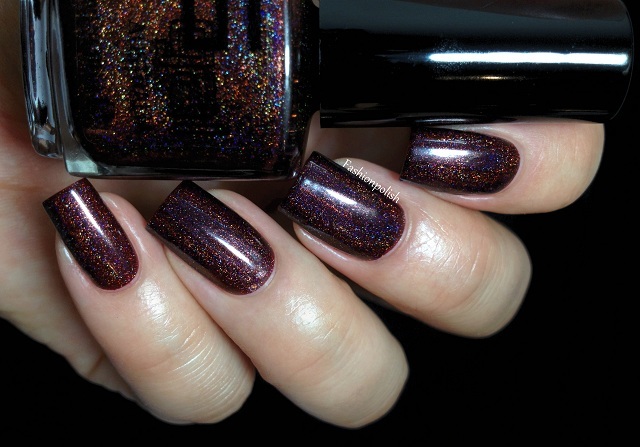 The linear holo is surprisingly strong and the color simply exceptional. It was also a little bit sheer and a third coat was necessary to reach full opacity but one single coat over a dark color is enough for a full effect so you might just want to layer it. This is 3 coats and no topcoat. I'm loving these new additions as they are both very unique colors for holos. Green Suede Shoes is very soft looking and Belgian Chocolate is such a gorgeous holo! There are also a few others that I have my eyes on, especially Teal Green and Teal Blue, you can see all 9 new colors on Chelle's blog Cosmetic Cupcake. 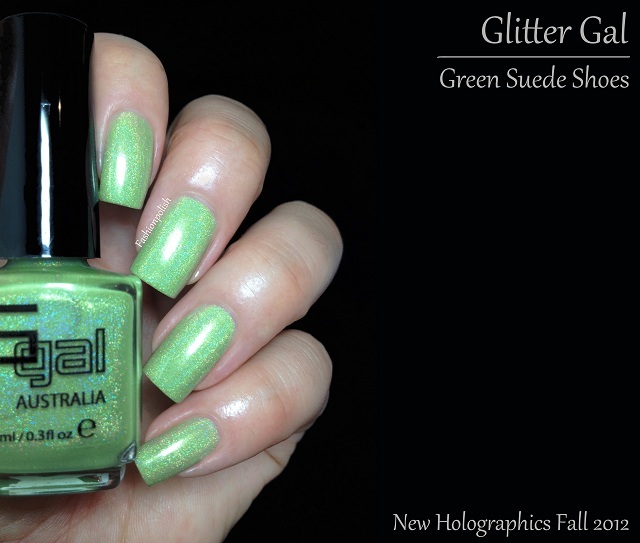 The Glitter Gal New Holographics retail for AUD AUS $11.95 for 10ml. They will soon be available for purchase directly from glittergal.com or through international stockists glittergal store locator. Glitter Gal uses the highest quality, most extravagant ingredients to offer our customers the most superior polish on the international market. We believe our holographic polishes are the best on the market. I love these so much! Especially the green! Belgian chocolate wins hands down - just for the name! green suede shoes is hot! I love both of them, they're absolutely gorgeous! The chocolate one looks really nice! Love, love, love the belgian chocolate. I love the chocolate one! It's just gorgeous! Green Suede Shoes is soo delicate and nice! Green Suede Shoes is one of the most beautiful shades I've seen recently!